Belmond is a high-end travel company which, as well as owning and operating a number of luxury hotels (and the Venice Simplon-Orient-Express and other luxury trains), also owns and operates seven luxury boats in France and Myanmar. Belmond operates two brands, Afloat in France and the Road to Mandalay. 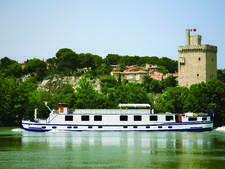 The former operates five boats on France's Rhone river and the Canal du Midi. 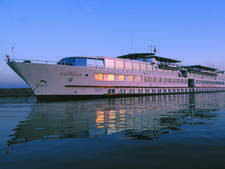 The latter offers spectacular Myanmar cruises on two luxury river cruisers. Though its itineraries are international, Belmond cruises are typically aimed at English-speaking passengers. This is cruising for the connoisseur, on exceptionally luxurious vessels. In France, the boats -- or more accurately, barges -- are all notable for their spaciousness in spite of their small size. Some of the features include heated swimming pools, sitting rooms furnished with period furniture, cabins with canopied beds and wi-fi throughout. Afloat in France barges also make a virtue of the local cuisine, stopping at tiny village markets to pick up local ingredients. In fact, when you charter one of the barges you can discuss the kind of cuisine you would like to try with the onboard chef. Passengers also have options to test their own culinary skills onboard. The Alouette is equipped with an open kitchen so that it can be chartered for special cooking cruises. Up to four guests can learn the secrets of regional French cuisine during onboard tutoring. Other themed cruises, based on activities such as golfing and antiques shopping, allow guests to choose a theme that interests their party most. Wine-tasting is also high on the agenda -- the barges pass through some of the finest wine regions in the world, including Burgundy and Languedoc. The Semaine des Grands Crus tour offers wine-buffs the chance to taste 33 of Burgundy's best wines, including Montrachet, Romanée Conti and Bonnes Mares. The six-night cruise includes onboard dinners hosted by a resident wine expert, onboard wine classes, tours of famous cellars, such as Joseph Drouhin, and dinners with the winemakers themselves. The Road to Mandalay operates in Myanmar on the Irrawaddy River offering three- to 11-night itineraries from Yangon in the south to Bhamo, on the border with China in the north. The 86-passenger ship includes luxurious en-suite cabins more akin to a five-star hotel than a boat; with TV, DVD, wardrobe and luxurious bathrooms with showers. The ship also has an Observation Deck with swimming pool, and gourmet dining, with a mixture of Western and Eastern dishes. It also has a gym and a small spa, offering various treatments. Belmond also launched a new Myanmar-based ship in July 2013, called Orcaella, which offers similar itineraries to the Road to Mandalay, as well as cruising the Chindwin River through western Myanmar as far north as Homalin, just 30 miles from the Indian border. Belmond attracts a sophisticated, well-heeled and well-travelled clientele used to the very finest in travel experiences. They are culturally savvy and interested in seeking out new experiences. It's not unusual to see young families on the French barges, as well. In France, Belmond operates five boats: the four-passenger Alouette, the six-passenger Fleur de Lys, the eight-passenger Amaryllis and Hirondelle; and the 12-passenger Napoleon. 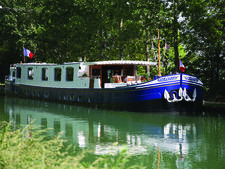 Operating under the brand “Afloat in France”, they ply the picture-postcard perfect waterways of the Canal du Midi, stopping at such classic French towns as Dijon, Lyon, Avignon and as far south as Carcassonne. Also known as “peniche-hotels”, these five boats -- which used to belong to European Waterways -- have all recently been refurbished, and offer exceptional standards of luxury. Alouette and Amaryllis are only available for full private charter; Fleur de Lys, Hirondelle and Napoleon are available on a cabin-by-cabin basis too, as well as private charter. Family itineraries are also available on all barges. In Myanmar, Belmond currently operates the 82-passenger Road to Mandalay, an ultra-luxury river cruiser which plies the Irrawaddy River, and on a separate itinerary north through forested gorges to Bhamo near the Chinese border. The 50-passenger Orcaella, an ultra-luxury river cruiser named after the rare, small, beakless dolphin that inhabits these rivers, launched in July 2013 and cruises the same route along the Irrawaddy River between Yangon and Bhamo. The boat accommodates passengers in two balcony suites, 15 state cabins, and eight deluxe cabins. 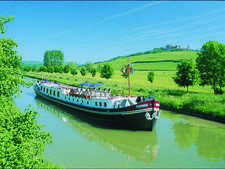 The five boats that operate under the Afloat in France brands sail along the canals and rivers, vineyards and plateaux of Burgundy, down the Rhone and along the Canal du Midi in the Languedoc, passing towns including Dijon, Lyon, Avignon and as far south as Carcassonne. In Myanmar, the Road to Mandalay operates three-, four-, seven- and 11-night itineraries along the Irrawaddy River from Yangon in the south, via Bagan and on to Mandalay; and on a separate itinerary north from Mandalay through forested gorges to Bhamo near the Chinese border. It's a breathtaking cruise through a timeless landscape of tiny villages and pagoda-studded fields. The 50-passenger Orcaella, an ultra-luxury river cruiser named after the rare, small, beakless dolphin that inhabits these rivers, will launch in July 2013 and sail itineraries similar to the Road to Mandalay's.